One of the many sunan (pl. sunnah) that has been lost by our Shee`ahs is in regards to what women do during Salaah. What am I talking about? I am talking about women placing their hands upon their chest / breast during salaah. I will present aHaadeeth from our Imaams and I will also present scholarly opinion from the classical scholars all the way to the contemporary scholars on what they say concerning the women placing their hands upon their chest (breasts). This action, placing your hands on your chest, is said to be a mustaHab act, not doing so will not make your prayers invalid. Wallaahu A`lim (And Allaah knows best). Highlighted: "Joins (at) her breast towards her chest her hands"
Here are a picture from a Salaah manuel that I have found at my house, this will allow you to see how women are suppose to put their hands upon their chest. Here is another one I’ve found that describes how to pray for women. By the way, I believe it would be HIGHLY beneficial for those to see that we do have a SaHeeH hadeeth going back to an Imaam (AS) and not just Zuraarah. Inshaa Allaah I believe Nader can post up the chain and that people can see that it does have a SaHeeH chain going all the way back up to the A'immah (AS). Yes, there is a SaHeeH chain from a ma`soom that tells the women to put their hands on their chest. It is suppose to be Muhammad bin `Eesa and not `Eesa bin Muhammad. This is a FANTASTIC chain. Thank you very much. MashaAllah, this information is very helpful. Since you were unaware of the form of praying, it is okay, you can start praying like this from now on. Bro, she places her hand towards her chest at the breast could also mean, keep hands close to chest like how it is said to keep legs without gap. U can keep hands on thighs and keep hands(upper) towards chest(without gap) at the place of the breast. Breast has been used specifically because of the word sadri in the hadis which could mean chest/Chester(jacket). And it is rai of one alim to put left palm on left breast n right palm on right and it is not a hadis. Plzcorrect me if I m wrong n also check the hadis which says; "the majus pray with hands on their chest" doesn't exclude women in any such narrations? Have any scholars from the past one hundred years commented on this? Brother Siraatoaliyunhaqun, I don't think you understand the hadeeth, it is specifically talking about the palms of the Hand, that is why Al-Mufeed has said that she places "her right fingers upon her right breast and her left fingers upon her left breast". You are really trying to stretch the meaning. It says the Majoos fold their hands and pray, that is why it says to pray with your hands NOT folded. Also, there are hadeeth from that Prophet (SAWAS) that says "Pray as your see me pray", but from the other actions of the women it seems like they aren't praying like the Prophet, I guess that is a contradiction as well, right? No. This just means that it gets specific for the women. Men and Women pray the same except for a few exceptions, like praying with the hands on the chest, and not having to touch the knees for rukoo`, and going down knees first before hands, and keeping your hands close together in sajdah, etc. Yes, actually every contemporary scholar has commented on it. That is why I have put the scanned image of Al-`Urwah Al-Wuthqa which the commentary of every single major contemporary scholar has been added. And if they would've disagreed with it, they would've added a footnote, as it is done normally with other rulings. eventually, I asked many akhbari ulema n they say as u said. So would that mean that bcos sheikh tusi went against his teacher's view most Shias went the other way. My intention was just to avoid any translation error n mufeed explained the hadis, which may or maynot be wrong however he was closer to imam's time. ahadis is alright n if we do not have any hadis which says otherwise then I concur with ur view. According to Shaykh Al-Toosi in his Al-Nihaayah, as I have pointed out, that he says the women pray with their hands on their chest. Al-Mufeed explains it very clearly, and I would take Al-Mufeed's opinion on this just because as you said, he is closer to the Imaam's time. Neither Al-Kulayni nor Al-Sadooq have an explanation on this hadeeth, well at least whatever is extant, but they all say the same thing, and Al-Mufeed's explains it eloquently. I have heard from some people, the older generation of women maybe 50-100 years ago, this practice was more common. Like, I have shown the VERY OLD salaah manual that I have found at my house. Nader, I didn't understand one thing which is going on here. Why are we trying to come up with our interpretation of how women should pray while there are currently several risalah amaliyah of our esteemed Marajey. Ay. Sistani doesn't state anything like this, in fact he says the hands should be placed on thighs, fatwa no. 986 (he doesn't differentiate men and women, when he meant to differentiate he would give different laws for both genders). Ay. Khui was also of the same opinion (fatwa no. 986, coincidentally). Further, no one encountered Ay. Khamenei, Ay. 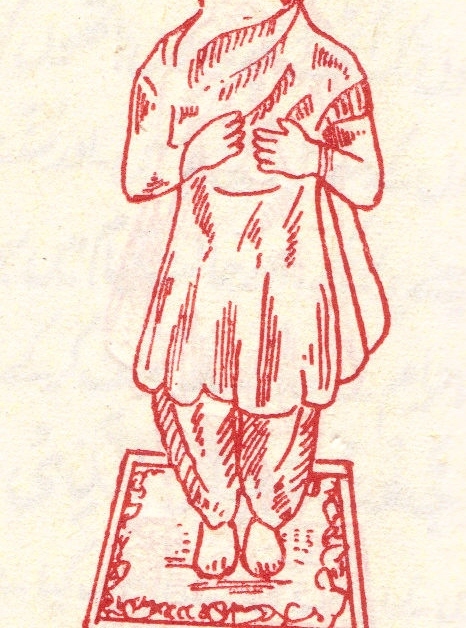 Khomayni, Ay. Golpaygani etc. giving such fatawas for women. We need to realize that we don't have the knowledge of biographies of narrators (Ilmul Rijaal), we are not schooled in hadeeth interpretation, and we don’t know which are Sahih and which are Daeef ahadeeth based on our reading even if those be in Al-Kafi or Man La Yahduruhu Al-faqee. 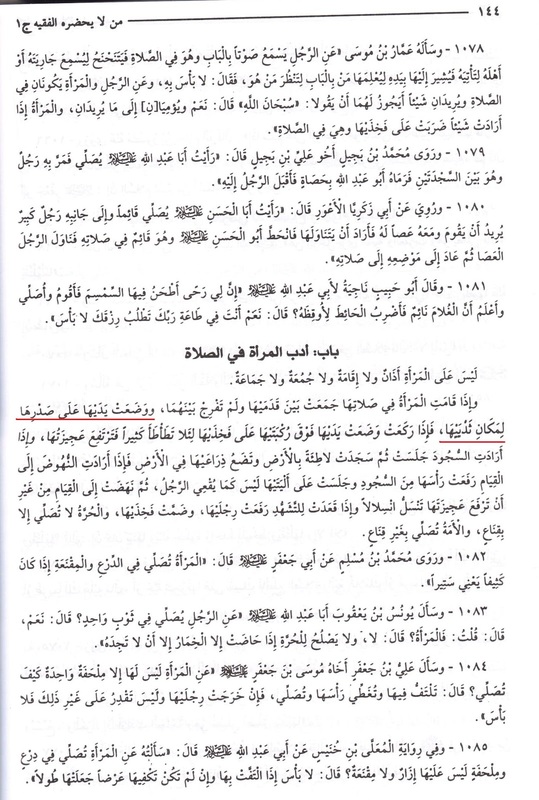 In contrast to our brothers from Ahle Sunnah, we don’t regard our Kutub al-Arba (4 books) as Sahih. When you read about Kulayni or Sadooq, they say that they collected whatever they could from the resources to the best of their knowledge and left it for later Ulema to differentiate the Sahih from Daeef. In fact, Sheik Sadooq says he didn’t provide much sanad in his writings in order not to focus on the narrators but to elaborate on the hadith. Further, he used to consult his literature before giving out legal verdicts. Unless a woman is under his taqleed (which isn’t possible after several decades of his death), she cannot follow this pattern of praying. The ‘Anonymous’ who questioned if she were praying wrong all these years with hands unfolded has nothing to worry about. You pray according to how your Marja tells you to pray. That way even if he did the wrong interpretation, Allah will hold him accountable, not you. Look that is the beauty of taqleed. Am I not much safer being a muqallid than being a Marja to be accounted for not only my deeds but also the deeds of thousands of my followers if I issue a wrong verdict? Just think, it’s no joke to take that position. The Imams always had representatives even during their times to solve issues of people. There was this story of a man who ignored the representative of his city and wanted to meet with the 6th Holy Imam directly with his question. The Imam told him why he came so far when his representative was present in his area. Whatever his decision would be, would be the Imam’s. The Qur’an too advises ‘Fas’alu Ahlazikr inkuntum La Ta’alamun’. I would be interested to know whose muqallid you are: Sistani, Khamenie, Amoli, Shirazi …there are nearly 67 of them living in the world today or are you continuing under the taqleed of a deceased Marja or you don’t believe in Ijtihad? Once I have a clearer picture, then we can move on from there. The ‘Anonymous’ who questioned if she were praying wrong all these years with hands unfolded has nothing to worry about. You pray according to how your Marja tells you to pray. That way even if he did the wrong interpretation, Allah will hold him accountable, not you. Look at the significance of taqleed. Am I not much safer being a muqallid than being a Marja to be accounted for not only my deeds but also the deeds of thousands of my followers if I issue a wrong verdict? Just think, it’s no joke to take that position. No one is interpreting anything, the hadeeth is clear, and Al-Mufeed is the one who has broken it down very easy to understand. You are disagreeing with Al-Mufeed and not me. If you've read all my posts, you will realize that I am mostly quoting `Allaamah Muhammad Baaqir Al-Majlisi, compiler of BiHaar Al-Anwaar, for the gradings, I do my own gradings as well, as I too, have studied `ilm al-hadeeth and `ilm al-rijaal. 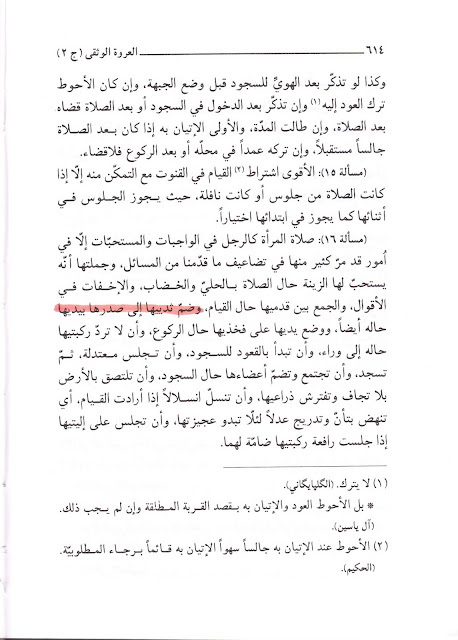 Actually if you see that scanned image of my personal copy of `Urwah Al-Wuthqa, you will see that ALL major contemporary scholars agreeing to this rule, because if they were to disagree they would've put their ruling. This book, `urwah Al-Wuthqa is the same book that is used in the dars al-khaarij classes for up-and-coming mujtahids. And where are you getting this idea that the mujtahid gets the sins of all his muqallids if he issues a wrong verdict? Is this in Hadeeth? can you provide me with a source? Thank you. I have quoted all major scholars from every period showing women pray with their hands on their chest. One question, why is it that the Ayatollahs are SOOO keen on telling women to put their forearms on the ground for sajdah, and for them not to bend so much in rukoo` and for them to put their feet together when they are in qiyaas, but when it comes to women praying with their hand on their chest they don't do that? Even though it is all located in the same Hadeeth as the other differences in men and women prayer. Thanks for replying to my post. "And where are you getting this idea that the mujtahid gets the sins of all his muqallids if he issues a wrong verdict? Is this in Hadeeth? can you provide me with a source? Thank you." I am not sure what language you speak, but the above quote I got from one Moulana Sadiq Hasan of Pakistan who went to school at Khui's time. He was delivering an Ashra in London (Muharram 2009) on Marjai'ath (Importance of Marajeh and their responsibilities). How the power of Marajeh caused the Tobacco Protest in Iran, how the call of Ay. Khomeini for men to stay inside their homes as haram on the night of revolution, and several other powers he discussed. Anyway, it was in his lectures he quoted that the Marajeh would rather prefer not to issue any verdict and be a simple muqallid of someone than to bear that responsibility and be liable for every follower's actions. I am not disagreeing with Al-Mufeed but let me state this in a different way. If Sistani doesn't mention this rule (of whom my family & I are muqallid), why do you think I need to take account of what Sheikh Al-Mufeed said in 10th century. Obviously, I cannot follow a dead Marja. And since I am not a mujtahid myself, its my shara'i responsibility to follow a Marja. Now, if we need to go with in-vitro fertilization, how would I know its haram or halal if I don't follow a Marja. If I am a muslim astronaut going to space, how would I know how to pray if my Marja doesn't tell me what to do. Obviously, Al-Mufeed and Al-Majlisi are not here to guide me. These are just representative cases, there are several other problems I'll face if I don't follow a Marja. And since my Marja has no saying on women to fold hands on chest, I need to follow him. Tell me what you would do if you were a follower of Sistani while Al-Mufeed mentions otherwise? I can assure you, that the so called thing of mujtahids taken the sins of their muqallids is no where in hadeeth, I know that for sure. This is actually only taken from Sunnee books. I understand the modern time's form of taqleed in that you cannot do taqleed to a dead marja`, but this has only started to come around until like 100-150 years, this is a totally new philosophy. I understand the questions about astronauts, in-vitro, etc, you need a scholar now. But your Salaah doesn't change, there are no more aHaadeeth being made now, so we should be praying the same way our Imaams have prayed and we our prayers should look like the prayers of our classical scholars such as Al-Sadooq, Al-Mufeed, MurtaDa, Al-Toosee. I've actually asked some teachers at a hawza about this hadith. Apparently, words are very crucial when it comes to interpreting hadith, almost like interpreting quran. If you misinterpret the meaning of ONE word, you will misunderstand the whole hadith. It says to place your hands TOWARDS your chest. The point is the woman is supposed to tug her arms towards her chest area, not "place them" on the chest. The hawza teacher said that just as the woman is recommended to bring her legs tightly towards each other, she is recommended to bring her arms tightly towards her chest. Again this is just a mustahab act, just like placing your hands on the ground first before you sit during "qu'oud" is mustahab. So be sure you're not changing the meaning of "tathum", which literally means to bring arms towards, not "place". Well I am sorry those Hawza teacher do NOT know Arabic properly. Here is what the hadeeth says. My Translation: "And she places her hands towards her chest"
وَ تَضُمُّ = "And she places"
Now what you are proposing is the word تَضُمُّ which means "she places", to mean "toward". Now right there, there is a problem. The word إِلَى means "towards / until" This is the translation that the hawza teachers are doing. "and she towards her hands towards her chest"
The word تَضُمُّ means "add, join, place, attach". it does NOT mean "towards" or anything near that definition. So they are indeed mistranslating and misinterpreting the hadeeth. May Allaah forgive them. Aameen. Sorry, You didn't fully read what I wrote. I didn't say it means towards, I said it means bring arms towards. I'm a fluent Arab, so I know words. If the Imam was saying to place the arms ON the chest, he would have said "tathaa'", which means place. The word تَضُمُّ means "add, join, place, attach"
>>Join, it is the closest to the meaning of the context of the hadith. "...and she joins her arms towards her chest"
The hadith says to "bring her arms towards", but does not give an exact detail of which part of the arm, so that said, one should assume the Imam is talking about the whole arm. is mistranslating the hadith, with all due respect. I only which to correct that notion. "places" in no way means "تَضُمُّ"
>> "ضمت ايديها الى طفلها" does not mean "she placed her hands towards her child", rather it means "she joined/brought her arms toward her child"
Joining/bringing the arms towards the chest means to bring them tightly towards the chest, like the way rasool Allah (pbuh) did it, but only that her femininity requires that she tugs her arms slightly. My question is that, I have recently read ahadith in our books about the method of prayer of a woman. I've read that the woman should place her hands on her chest. I pray with my hands on my sides. May you please tell me if these ahadith are reliable? Or are they fabrications? Am I praying correctly? Your prayer is correct and it is mustahabb while standing that one put hands on thighs. So, as you see, the correct tafseer is that the woman brings her arms, like the prayer of a man but, tightly towards her chest. When the arms are tugged tightly towards the chest, they will be placed on the thighs. But this is only mustahab, she can pray with her arms loose on her sides as well. The recommended actions for a female in namaz is only to cater for her femininity. May Allah swt accept all of our prayers, inchAllah. 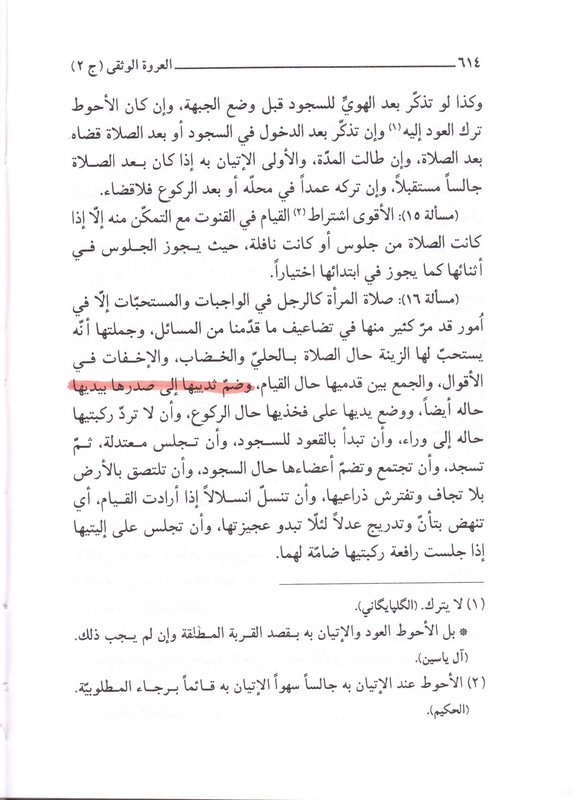 Hmm, Brother Anonymous, Al-Mufeed, arguably one of the 3 best scholars of Shee`ah Islaam, who happened to live right after the minor occultation was complete, if you look at his definition and interpretation and break down of the hadeeth, that is sufficient, and we don't need to discuss this further. He lived at that time, where his Arabic was much closer, and the people who read Salaah was more closer to the Imaams, so I would take his word over some "ayatollah" who lives 1200+ years after the event. So because one of great scholars has a specific opinion on the break down of the verse, we must all blindly follow, no questions asked? No breakdown ourselves? No searching for different opinions to see what the truth is exactly? Surely you don''t expect that to be your rebuttal. Your response to everything that I wrote is that because that specific scholar lived closer to the Imam (ajf)'s occultation, then he must be right? Is that how you base truth from falsehood? Who is the oldest? You can choose to base your opinions on which scholar is the "oldest", but I will base mine on the real translation of the hadith. From what I've gathered is that Al-Mufid, being great scholar, no doubt, but later on said there were some opinions he weren't sure about. How can I base my foundations on that? Must I not use my knowledge and expand it further? Must I not choose under both lights, without prejudice? I am not blindly following Mufeed, nor do I blindly follow any scholar, if you haven't noticed my blog but I am not some "taqleed" (blind imitator) type of person. The reason I highlighted Mufeed is because he lived closer to the times of the Imaams. And you main concern was based off the translation, the arabic wording. Well everyone knows the Arabic we have even the fuSHa is a watered-down version of what type of Arabic was spoken during the times of the revelation of the Qur'aan and the Imaams. Your definition is pure dhann (speculation), and Qiyaas (analogy). You are trying to use other rulings of women in pray such as pring the arms closer during sujood, which of course Qiyaas is haraam in Shee`ah Islaam. The MOST literal translation without interpretation and dhann (speculation) added. "And she joins her hands upon her breast at the place of her chest"
Which by that translation, this shows that the Images I have posted up and the explanation given by Al-Mufeed is 100% correct. Just because you don't see it nowadays, doesn't mean it isn't right. It is those very same "hawza" teachers who are taking away sunan acts little by little. Also, I wanted to highlight ANOTHER hadeeth, whcih is already on the blog post. I surely hope you aren't going to tell me وَضَعَ does not mean "place, lay, position, put". By that VERY hadeeth it gives an insight to the other aHaadeeth, and basically shows that putting the hands on the chest like the illustrations is the correct method of prayer for women. and you don't think our major scholars (contemporary), who I would guess, have studied Islam, definitely more than you, for decades, would've read/come across/studied these hadiths mentioning the placement of hands on chest? No offense brother-but having several arabic hadith books in your home library, or having studied for some time, do not qualify you to issue own verdic "it's ok you can start praying like this from now on"-instead of at least advising her to consult her own scholar and see what he has to say about the hadiths? Here is a contemporary scholar for you, I hope you regard Al-Khoei as being very high and of high esteem. And I hope Sayyid MuHsin Al-Hakeem is contemporary enough for you. "ضمّ ثدييها إلى صدرها بيديها " as you please. If women are to place their hands on their chest, how come no shia scholar has ever come forth and made it clear? Also brother, if this is what you believe to be the right way for females to pray, why don't you discuss this with a scholar? Either, call, email, or better yet, meet up with one. Don't you think your reward would be great? If you are so certain, then I really don't understand why it's so difficult to ask a shia cholar why this matter isn't prevalent. it is also something to take note of that a lot of people with negative reactions tend to be 'anonymous'. lol, people with negative reactions tend to be anonymous? I'm not quite sure what is required of me, write my full name? I would assume, "phoenix" is as much an anonymous username, as is "anonymous". My main issue, and concern is that this gentleman is issuing own verdicts without full knowledge, which is very dangerous. There are numerous great scholars, and not once have I ever heard any of them comment on the way women pray. If we have been misled all these years, why doesn't this brother 'bring' it to the attention of our respected scholars? Brother, when the username "phoenix" is put, majority of the people on here are from SC, so they know who it is. I don't understand how I am issuing a verdict, since the only thing I have done was present hadeeth and scholarly viewpoint. I didn't put anything from my own personal opinion. My opinion doesn't matter. If you read my posts on this blog, you will see that I don't give my own personal opinion, I usually let the hadeeth do the "talking". I don't even try to give "commentary" on hadeeth. Because our A'immah were eloquent, which means they could easily convey their viewpoints to their follows so they could understand. I'm not from shiachat. Regardless, a username is still as anonymous. The verdict part was directed to one of your comments. My issue, is why you have chosen a little corner on the web, directed at a certain group of people, instead of going directly to a scholar-and dealing with it? Have you heard what the scholars say of these hadith? What is actually meant with "ضمّ ثدييها إلى صدرها بيديه"? Arabic is a complex language. Words change depending on the context. Instead of guiding a few hundred, why not the entire shia ummah? More important, do you honestly not think our scholars know of these hadiths? Do you actually think they've simply chosen to disregard them? Let's be careful. Good intent, doesn't equal good outcome. and I'm not a brother. Why do I need go to a little scholar, when I have already mentioned the biggest of the big names from Shee`ah scholars from the beginning to the end. Also, don't forget I have Mufeed's interpretation of this, which if you ever read Mufeed's books his Arabic was phenomenal. Just because you don't see it, doesn't mean this isn't right. You don't see men sit in tawarruk anymore, that doesn't mean that the men shouldn't do tawarruk. Even though those hadeeth are explicit as well. I've read through all your responses to the Anonymous sister and I'm going to put it really straightforward for you: you are full of arrogance. Humble yourself, Brother Nader. Seriously? "A little scholar..."?!? You have GOT to be kidding me. Who do you think you are belittling those that have spent their entire LIVES studying the Deen of Allah? Know that regardless of your intentions, an ounce of arrogance in your heart erases all your good deeds. You are doing a GREAT INJUSTICE to Shi'a Islam. And that is coming from an ex-Sunni. Stop posting random ahadith you are finding in your own books and using your limited aql (or lack thereof) to express an opinion on them. May Allah GUIDE YOU and soften your heart and humble it before you do more damage to His Deen! "everybody know that the verse says the ARM"
"Again this is just a mustahab act, just like placing your hands on the ground first before you sit during "qu'oud" is mustahab." Maybe you will be hearing this too for the first time, but for women it is to sit FIRST and then to place the hands on the ground. "I'm a fluent Arab, so I know words." Vocabulary is never enough; grammar is more important than that. And also how the meaning of words can change either to a small extent or drastically depending on the prepositions succeeding (or preceding) them. I don't think you understood what I meant by "little scholar". What I mean by that is going to your local resident `aalim, who has probably studied for about 5-10 years in the hawza. I have already given the "major" scholars who have studied islaam their whole lives, literally. From the classical scholars to the contemproary ones. And I have yet to give my opinion on this issue or any issue on my blog. I have merely narrated the aHaadeeth and opinions of scholars. Actually you gave your opinion very clearly by making this post to begin with and then defending it in the comments section. By making these articles and posts on the internet, you are expressing and implementing an opinion on these controversial issues in the Deen. You're only fooling yourself if you think you have no opinion on these subjects or have yet to express said opinion. Even if you were referring to a resident 'aalim by saying "little scholar," they still have done more research and studied Islam longer than YOU. How long have you studied Arabic for? Do you know tajweed? How long have you even dwelled into these topics? Under what scholar did you study? Where did you study Islam? So, again, I suggest you humble yourself. Talking about Islam when you don't know enough is one of the biggest sins. Be fearful of making mistakes lest you say something against the Prophet (sawws) and his Ahlul Bayt (as) and ultimately Allah (swt). And we all know the place for such a person. Please bring this hadeeth out from Al-KhiSaal. So I can anaylyze, I can't find it at the moment. I swear by Allah the Nabi said: I fear one thing more than Al Dajjal , the wicked scholars!. This is the time. We follow the prophet and his family not a scholar . Period! Salawat! I had put this question to Ayatollah Sistani via and his office has replied back saying that it is not permissible. Salam! all issue of regarding salah. here you can download Salah for Islamic Sisters, a most authentic and renowned Islamic Book.it is very highly knowledgeable book you must be read it. The book is also available in Urdu language and other.